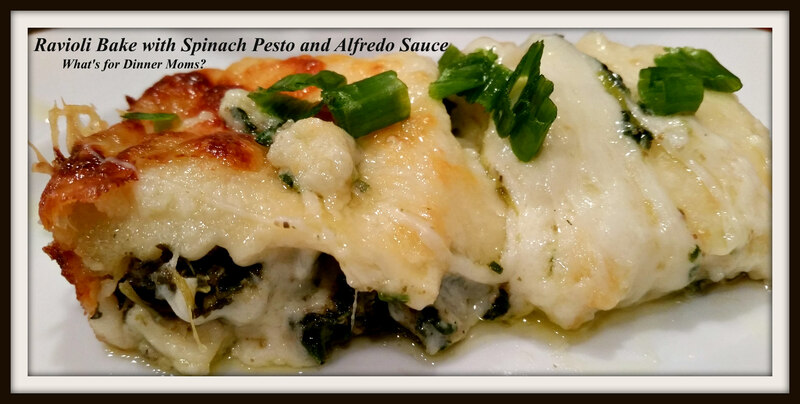 Ravioli with Spinach Pesto and Alfredo Sauce – What's for Dinner Moms? One thing you may not know about me is that I LOVE Disney World. In fact I even have had another blog “Earning My Disney PhD” that I started in 2009. That blog has been inactive for awhile as I started a Disney page on this blog so I could keep everything together. To niche or not to niche, that is the question! But, I am slowly beginning to move some of my favorite posts over to this blog so for awhile you will see Disney and food posts. Eventually I will close the other blog but for now I want to move things over here so I don’t lose some of my favorites. So, in between moving blog posts this was one of those nights where at 7:00 pm we were all looking at each other with the “What’s for Dinner?” look. I had even gone grocery shopping! I had gone to two grocery stores and had full cupboards and refrigerator and still we were looking at each other. Okay. Pull out the ideas for the month. I had picked up frozen sausage ravioli, in the freezer I found a leftover box of spinach and the refrigerator produced cream, butter, Parmesan cheese, and basil pesto. We have a meal! Yes. We all have days we don’t want to cook dinner. It is my family that keeps me going. All three of us helped make dinner. My partner is a corporate accountant so this is her busy season. She leaves about 7:30 am and comes home about 10:00 pm. She does this from August to mid-November. We are used to it by now as she has been doing this for almost 20 years. I think the thing I like best about our dinners is nights like this where we all pitch in to help. I was putting the dish together and shredding cheese while my daughter made the alfredo sauce and my son prepared the spinach and pesto. We are all in the kitchen talking and when dinner is done and we are eating together it is somehow better because we all have part of the dish we helped with. This dish was cheesy and flavorful. The Parmesan cheese sauce and the spinach mixed with the pesto were so good. 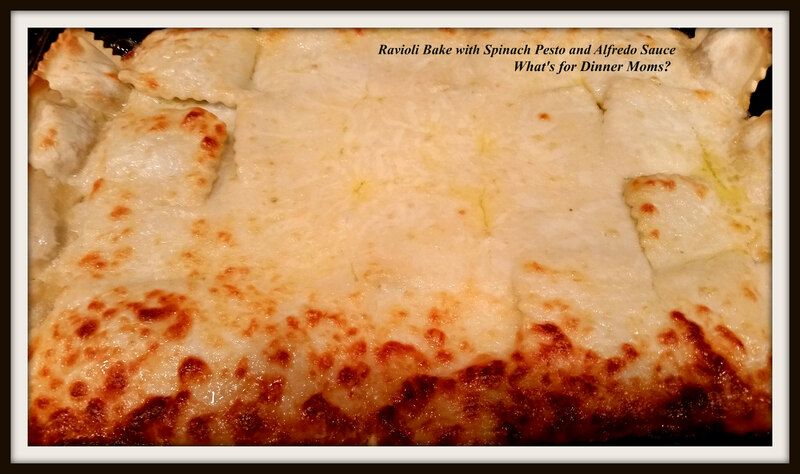 A bit of mozzarella cheese on top made it have that stringy, gooey texture. It was fairly simple to make. The most difficult part of the entire process was making the alfredo sauce. Yes, you can use jarred sauce but homemade sauce just takes this dish into the statosphere of taste. I served this with green beans and a green side salad to complete the meal. 2 jars Alfredo sauce or recipe below – I HIGHLY suggest making your own! Preheat oven to 375 degrees. Prepare a 13 x 9 casserole dish with non-stick spray. Make Alfredo sauce (if desired) by melting butter in a medium saucepan over medium heat. Slowly pour in cream and allow mixture to almost come to a simmer. Add salt, pepper, Parmesan cheese, and garlic powder if desired. Thin with chicken stock if needed. Add 1/3 cup of Alfredo sauce to the bottom of the casserole dish and spread across pan. Layer 1/2 of the ravioli in a singly layer flat sides down in the pan. Mix together the spinach and pesto in a small dish. Spread this mixture over the layer of ravioli. Spread 1/2 of remaining sauce over the pesto layer. Layer remaining ravioli, flat side up, in a single layer over the sauce. Pour remaining alfredo sauce over the ravioli and spread to cover. Sprinkle with mozzarella cheese and Parmesan cheese. Bake for 30 minutes. Raise heat to 450 degrees and allow to brown for 3-5 minutes. Remove pan from oven and allow to rest at least 5 minutes before serving to set dish. Oh my goodness there is no way this is not amazing. I add a bit of garlic because my family likes the flavor a bit more. But, it can also be left out. I’ve actually only tried making my own alfredo sauce once and wasn’t thrilled with the result (grainy)… but lately I’ve been inexplicably keeping a supply of heavy cream and buying my parmesan in wedges so IO may have to give it another go sooner than later! This recipe looks delicious. Using the wedge cheese makes a difference. Sometimes I used canned cheese if that is all I have but it has so many more fillers that it tends to be grainier. I think I used the pre-shredded parm when I made it… it was literally 10 years ago. It got less than stellar reviews from my husband so I never tried it again. Re-shredded parm has an anti-clumping agent coating it as all pre-shredded cheese does. I EVEN if it says 100% cheese the FDA considers it a minimal additive. Thank you! It certainly helps me when they are willing to help! My daughter hates touching raw meat so I usually have to have her cut things or stir things while my son pounds meat. Lol. As one of your vegetarian followers, I am always so happy to see veggie options. This looks like a yummy recipe. Looks so cheesy & comforting! Thank you so very much! You ate so very kind! Are! Slip of the finger. Wow looks just wonderful Marci! I agree with you on making your own alfredo…it’s so simple and tastes so much better! Also, don’t you just love browned, bubbly cheese? Probably one of my favorite things. We argue whose turn it is to pick the cheese off the edge of the pan! Lol!